Around the BLOCK | Where readers find restaurant profiles, travel recommendations, cooking tips, and food trend discussions. After two pleasant visits to Tavern in the Village, the new hot spot in Prairie Village, it would seem that owner Kelly Manning has a winning formula. He’s worked in the PB& J restaurants, at Houston’s and Morton’s, so he has a solid pedigree. 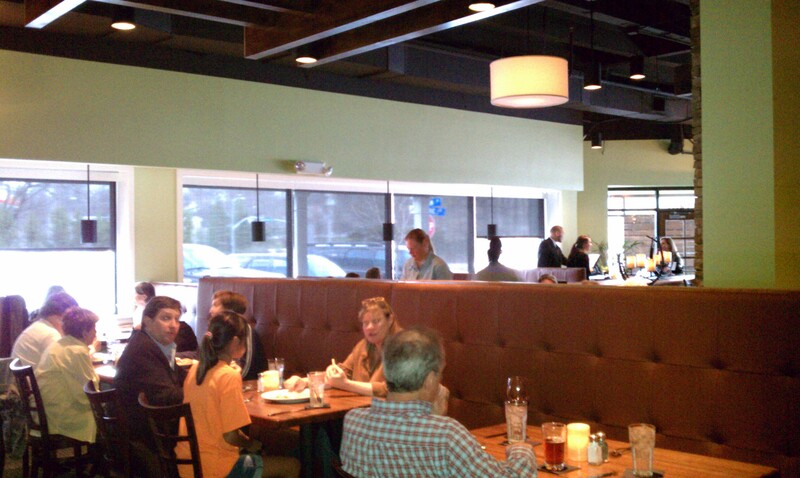 The Tavern is a comfortable place, with well-spaced tables, spacious booths and nice lighting. It’s family friendly, and on both occasions the service was c ompetent. The menu, which is the same at both lunch and dinner, has a broad range of options, including chicken tacos, creole pasta,fresh fish, grilled pork chops and steaks, as well as a dozen salads and sandwiches. And, in keeping with Manning’s plan to attract repeat business, prices are reasonable. 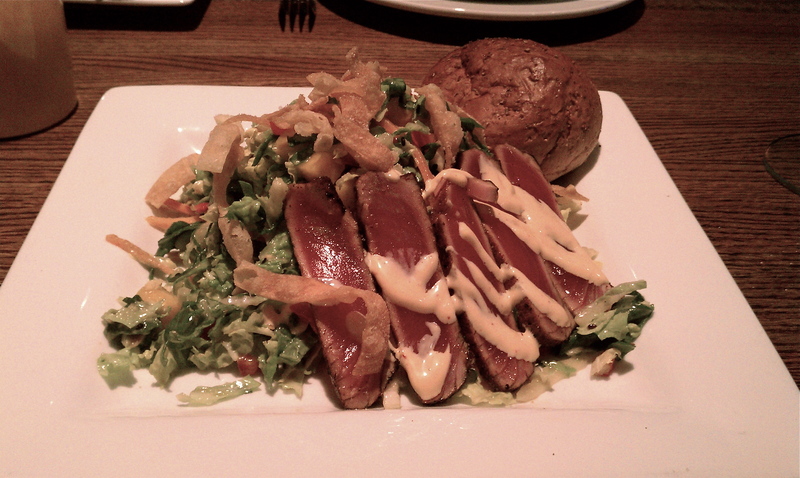 I enjoyed both the Santa Fe chicken salad and the Asian tuna salad. However, each of them, as well as the soup and salad combo, come with a very average roll on the edge of the bowl. There’s something about the rationing and presentation that rubs me the wrong way. A bread basket is much more gracious. The chicken nachos were an interesting appetizer, displayed as individual nacho pizzas with black beans, charred corn, pico de gallo and a goat cheese sauce on saucer-sized tortillas. Pretty as well as tasty, and certainly not an appetite-killer as some nacho platters tend to be. The upscale chicken tacos are also a bundle of flavor, served with a bowl of black beans to make it a complete meal. I have yet to try the entrees, but I did get a look at their presentation during a recent tasting event. All of the dishes looked quite substantial and are accompanied by whipped potatoes and green beans or asparagus. And head bartender David Smuckler knows what he’s doing–he was the Greater Kansas City Bartending Competition Champion of 2007. The cocktails are creative, employ many ingredients I’ve never heard of, and have some fun names, like Thai Tavern Julep, Rosemary Monk, and Peach New Fashion. Being more of a wine snob than a cocktail maven, I was delighted to see Orin Swift’s The Prisoner on the wine list. Did I order it at $78 a bottle? No, but it’s an indication that wine is not an afterthought. 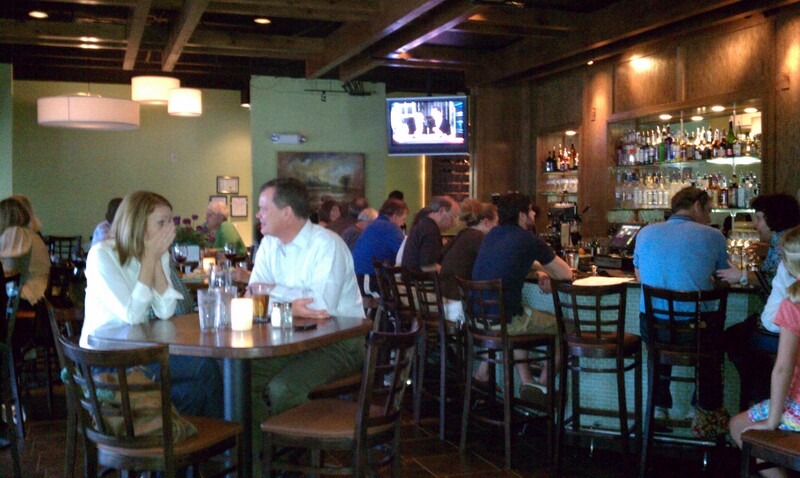 Judging from the crowds, it would appear that the Tavern achieves its goal of being a neighborhood restaurant with broad appeal. The concept is safe which, in this economy, is probably smart. And it’s been packed since day one, with families and couples young and old, most of whom are probably from the surrounding area, delighted that Prairie Village finally has an upscale restaurant that still manages to fall in the “something for everyone” category. I’ve never been a tofu fan. That is, until recently. I’ve had tofu a number of times in restaurants, but what really got me going was making dishes at home with tofu. For the other novices among us, tofu primarily is packaged as soft, firm or extra firm. I’ve mostly stick to soft tofu, because I always found it to be more palatable when crumbled like scrambled eggs. 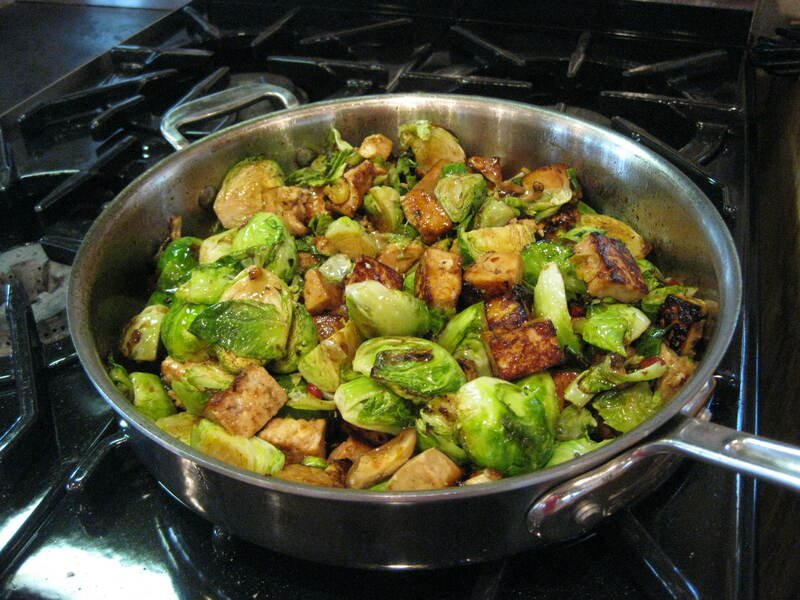 Until I tried Brussel sprouts with tofu in a sweet chili sauce, and now I’m a convert. This is one of my new favorite dishes, especially when tossed with Chinese noodles. That makes it more of a complete meal; spooning it over rice also works. Go to the following website for the recipe and some great pictures. 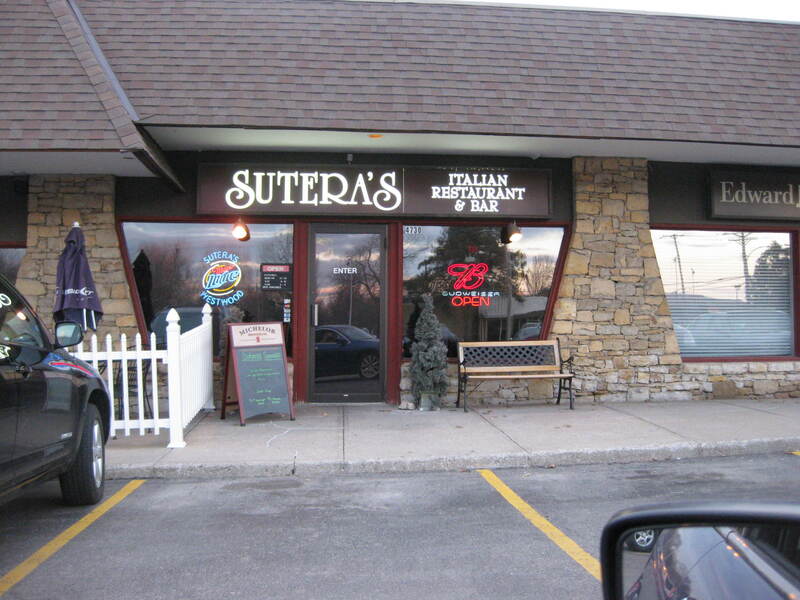 Sutera’s has been around for more than thirty years. First in the West Bottoms, then in Brookside, and now on Rainbow Blvd. 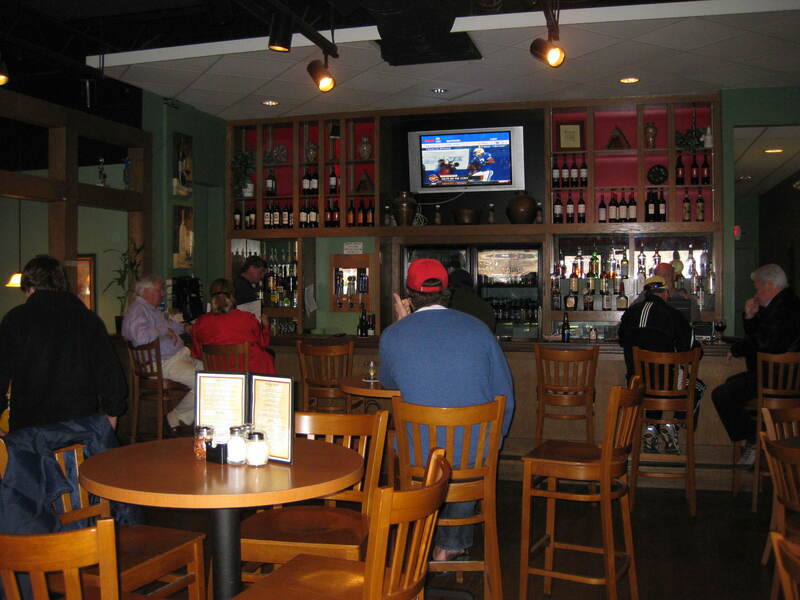 It’s a family friendly, neighborhood joint, suitable for drinks while watching sports on TV, or for a full meal in the dining room. 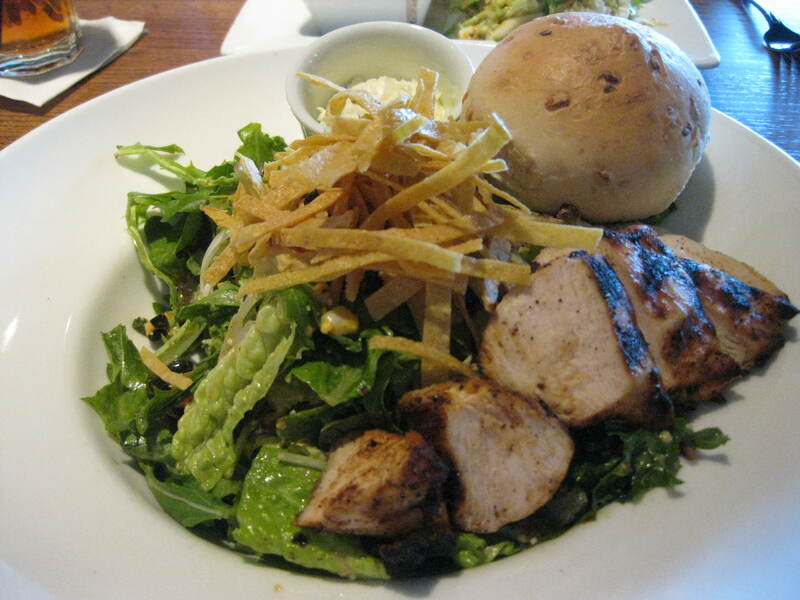 Though it’s primarily an Italian restaurant, diners can also order burgers, wraps and salads. But since pasta and pizza has been their bread and butter for so many decades, that’s what we had. Sutera’s menu states that although ” we didn’t invent pizza, we merely perfected it!”, but after sampling it, I’m not sure I agree. 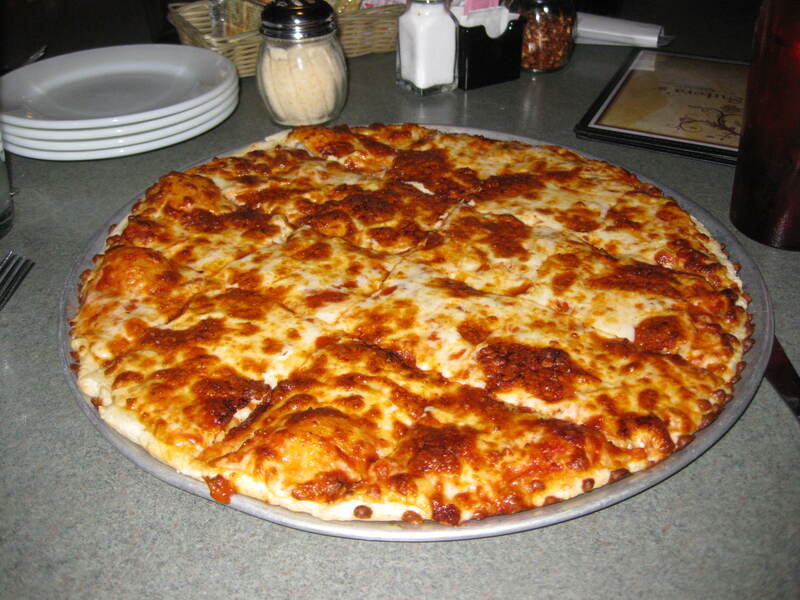 I ordered a large cheese pizza and my mouth started watering when it was placed in front of me. There was tons of cheese on it and it was nicely browned and bubbly. The crust looked thin, and it was, but unfortunately it wasn’t crisp. The pizza looked done on the top, but lifting up a piece, I noticed that the bottom hadn’t browned at all. And though there was plenty of sauce, it was the same as the sauce in the lasagna and on the rigatoni. I’d rather have a real pizza sauce, not pasta sauce on my pizza, especially since I didn’t love the taste. 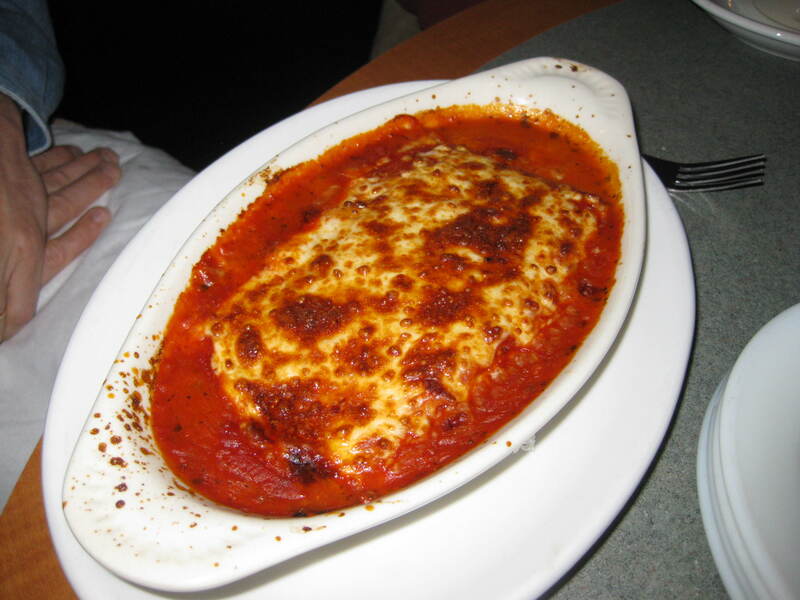 Two of my dinner companions had the lasagna–one with cheese and one with meat. Though it looked good coming to the table, neither of them raved about it. Too much of that same sauce and not enough flavor in any of it. 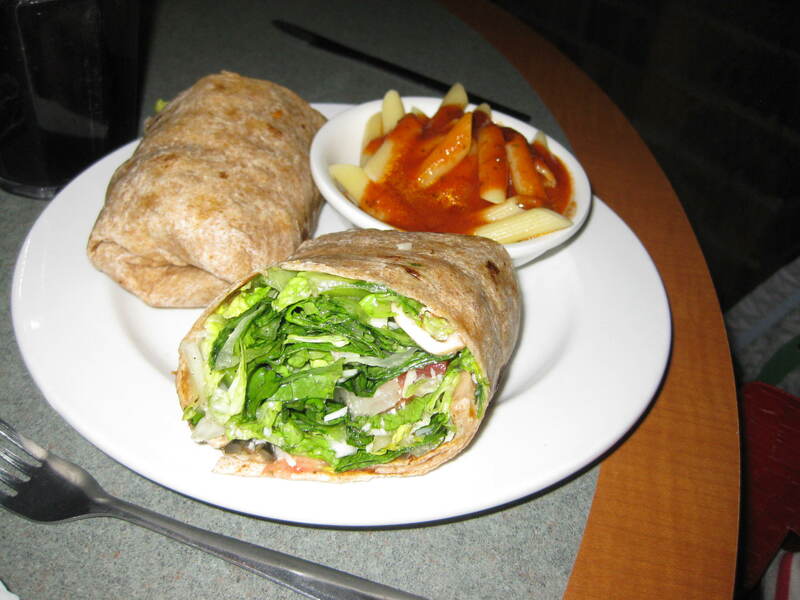 If you’re watching your carbs, the veggie wrap is a tasty alternative. It’s basically a salad wrapped in a tortilla. Though the food didn’t impress me, there’s a reason Sutera’s has been around for so long. 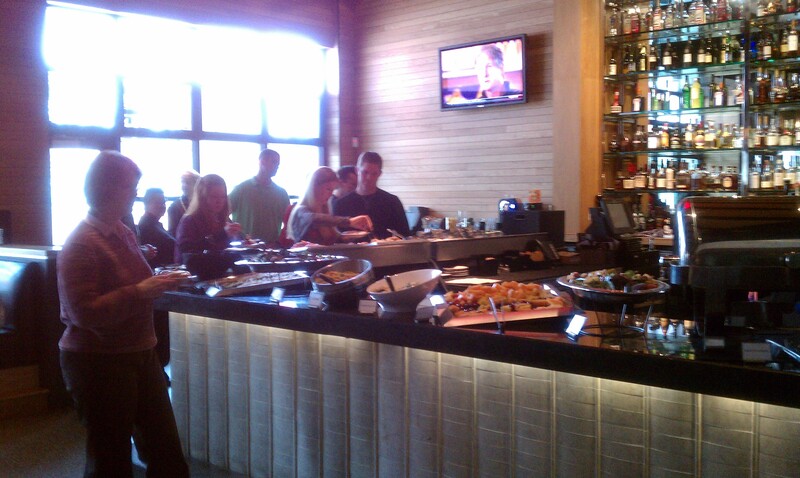 It has a comfortable vibe and, looking around the dining room, everyone seemed to be enjoying themselves. Whatever they are doing, it seems to be working. 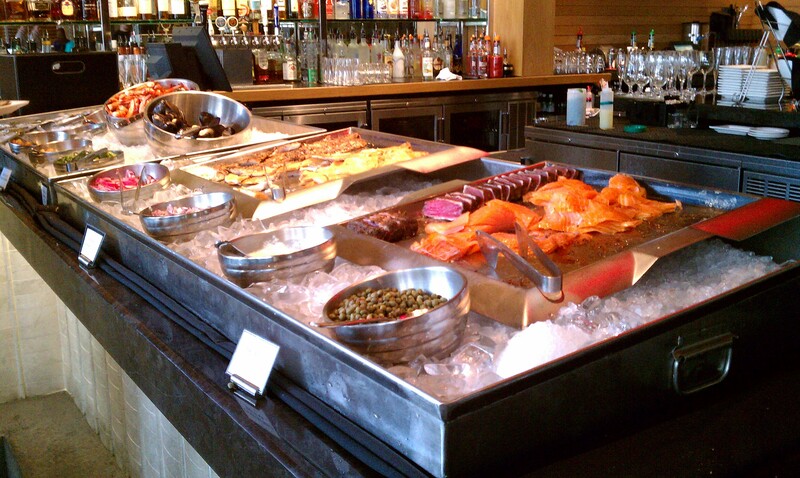 Though I am a big fan of the Bristol’s Happy Hour in the Power & Light District, I had never been to the Sunday brunch buffet there. It’s quite a spread. Tables are arranged throughout the restaurant to avoid overcrowding–one is for cold food, two for hot, and one for dessert. Those wanting a waffle can place an order through the server. The cold food table was my favorite. 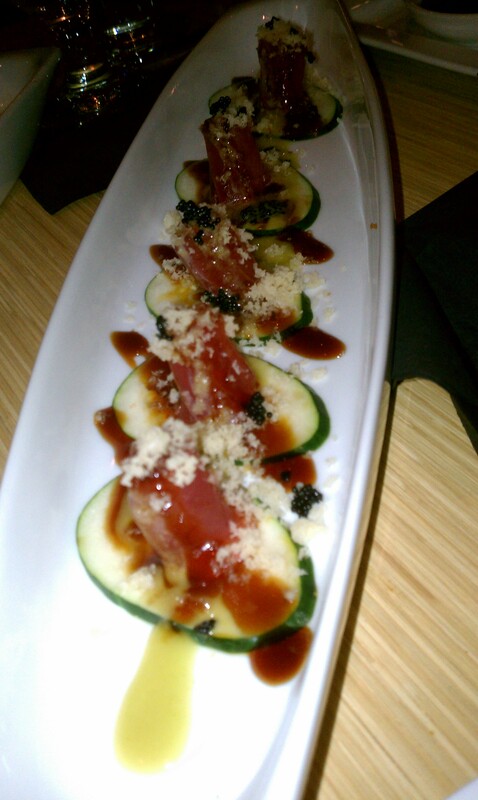 Flash seared tuna, seaweed salad, tuna sushi rolls, smoked salmon, scallops, and cold shrimp lined one end. Multiple vegetable salads rounded out the options. Large bowls of wasabi and ginger, sour cream,horseradish and cocktail sauce complemented the raw bar. There was a hot table for carved tenderloin, cooked perfectly and grilled with a very smoky crust, and made-to-order omelets. The other hot table was less successful. Mushy jambalaya, dry shrimp enchiladas (made with crepes, not tortillas), and overcooked brussel sprouts, along with the standard eggs, bacon and sausage. Dessert helped make up for that gap in quality, with squares of the Bristol’s famous carrot cake, an assortment of cookies and a lemon meringue tart. Glancing around the dining rooms, it was clear that many customers intended to make this their dinner, too, piling up their plates and making multiple trips to the buffet tables. Even if you intend to eat another meal later in the day, at $21 a head, this is a good deal. During the transition, you may be unable to access my posts on Urbanspoon. Until the broken links are fixed, please go directly to my website and search at the top right of the page for the restaurant you would like to read about. I’m also trying to transfer all of my subscribers over to my new home, but there are still some kinks to be worked out. 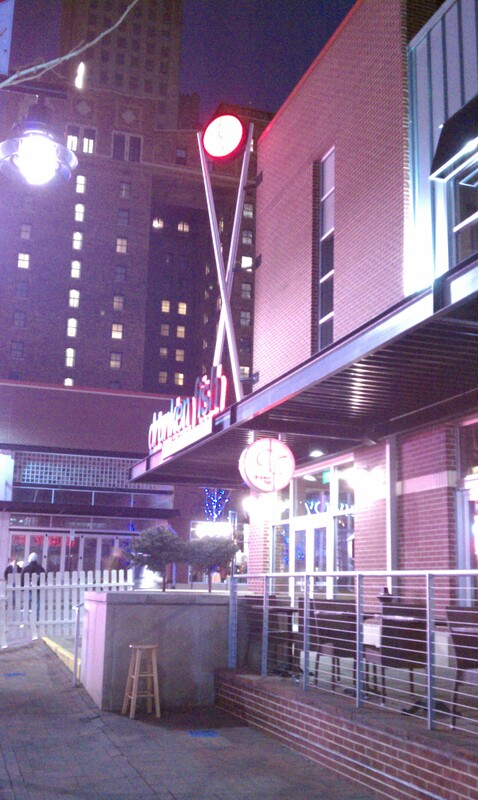 I’ve been less than impressed with the quality of restaurants in the Power & Light District, so when I tried Drunken Fis h I kept my expectations in check. It’s not exactly a chain: there are three restaurants in St. Louis by the same name, and this is their first foray outside of the city. It occupies the space previously occupied by Bice–in fact, they haven’t even replaced all of the awnings yet. If recollection serves me correctly, even the furniture is the same, but don’t quote me on that. The menu is quite large, not the typical sushi restaurant in that it has substantial entrees in addition to the raw fish component. And I’m not talking just teriyaki–pork chop, tuna, Chilean sea bass and even lobster tail are options for the non-raw eater. There are of course the ubiquitous makimono rolls, some typical, some intriguing. But what sets this restaurant apart from all the others are the appetizers listed on the menu under “new style sashimi”. Sizzling Snapper comes to the table on a lovely long oval plate, already dressed with sesame seeds, ginger, garlic and yuzu-soy. 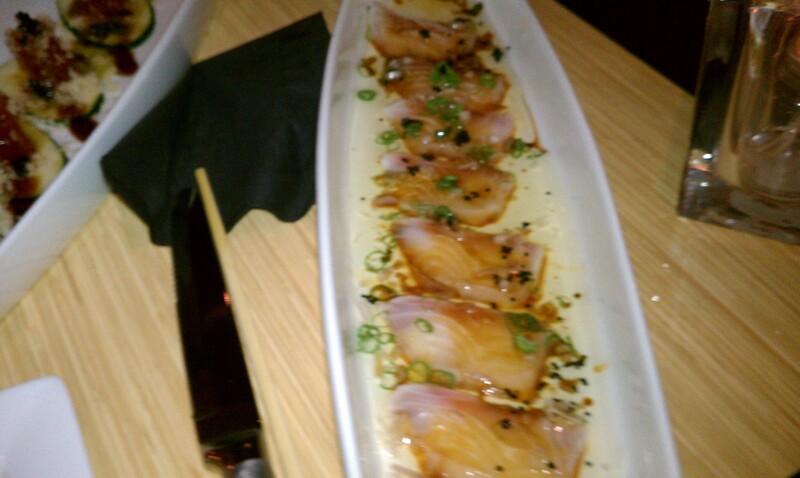 The server then pours hot olive oil all over the thin slices of fish. The oil cooks the fish a tad, and combines with the other ingredients to form a dressing of sorts. 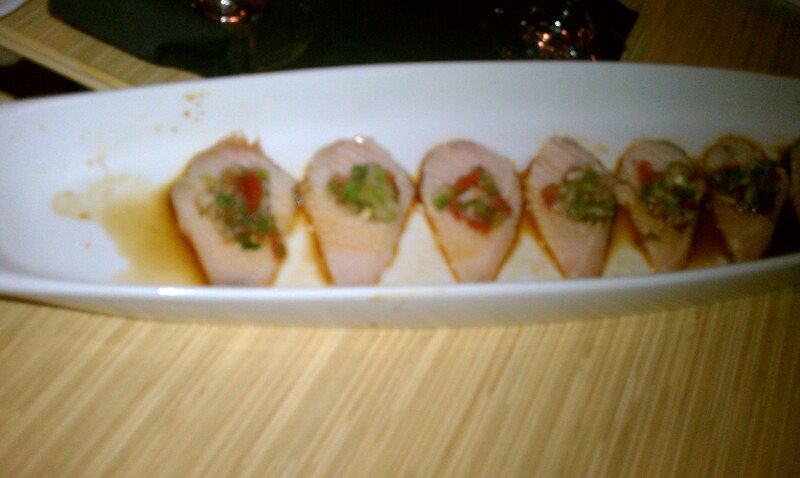 The Yellowtail Mexicano features sashimi with a jalapeno pico de gallo and ponzu sauce, a bit of heat to marry with the umami taste. In another twist, instead of standard tuna poke or tartare, tuna sashimi was mounded atop a cucumber slice, and topped with wasabi mayo, scallions, tobiko and eel sauce. Not a dainty bite to be sure, but worth figuring out how to get it in your mouth. 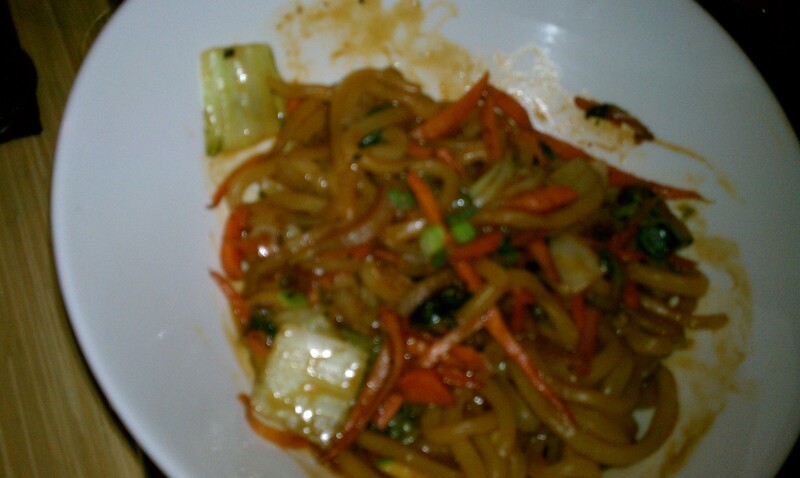 We also tried a noodle dish, udon with vegetables, customized to satisfy our need for spice. The noodles were cooked perfectly and the sauce was just right. Not too sweet, not too salty. 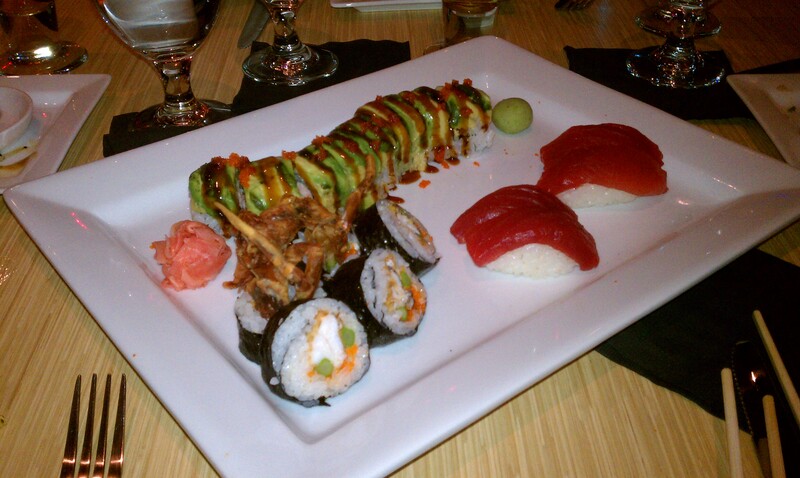 The sushi rolls were standard, though they all had creative names. The portions were skimpy relative to the price tag. Once this restaurant is on everyone’s radar, it will probably draw the typical P&L clie ntele. They’ll undoubtedly appreciate the vast and inventive cocktail list. I’ll stick to Japanese beer, but I think this is a welcome addition food-wise to the uninspired selection of restaurants in the entertainment district. 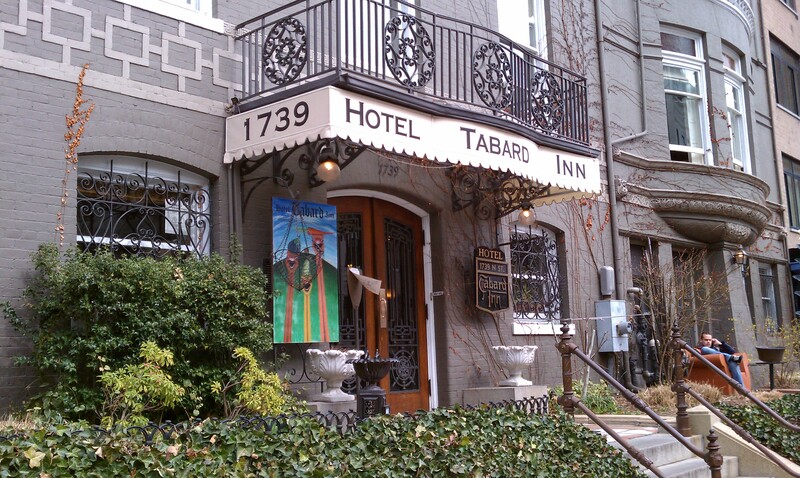 The Tabard Inn has long appeared on “Best Brunch” lists in the DC area. In fact, it’s one of those places where you need to call a month in advance to insure a reservation. 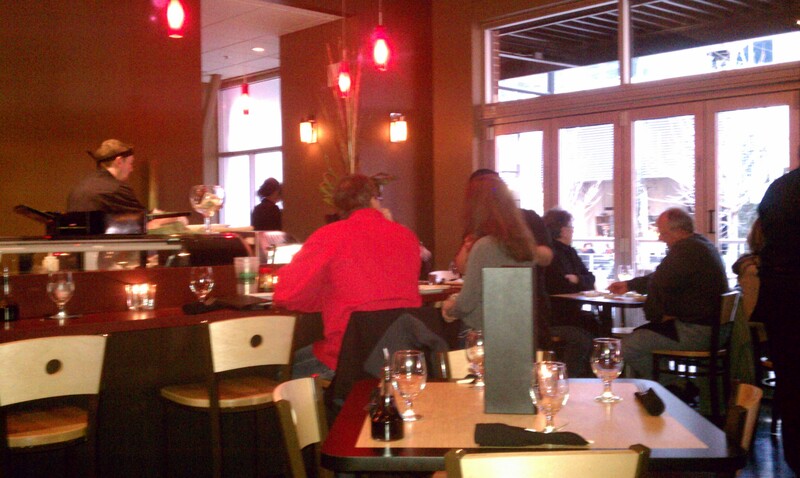 I made that call and was rewarded for my efforts with an 11:30 am Sunday reservation (Saturday brunch is also served). The historic inn in which the restaurant is housed is lovely. 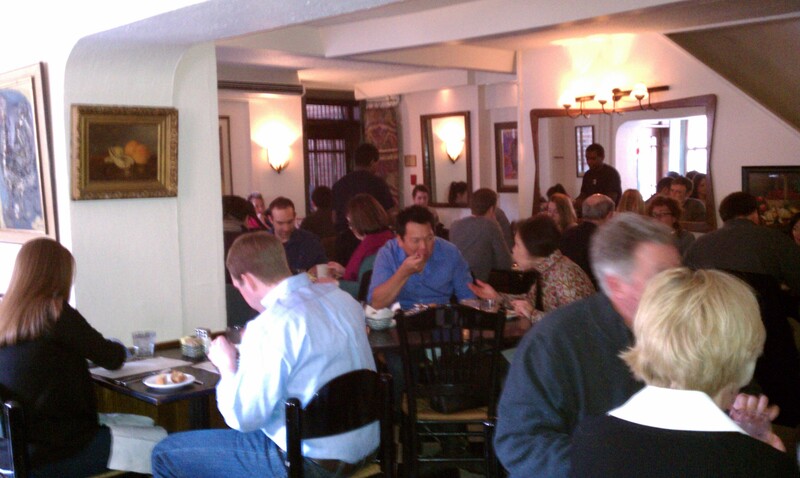 We had to meander through the small, quaint rooms to find our way to the back where the restaurant sits. We announced ourselves to the hostess about 30 minutes early and assumed we’d have to wait for an open table. We heard her tell a person at the other end of the phone that they could come in without a reservation, but that it would probably be 2-3 hours before she could be seated. 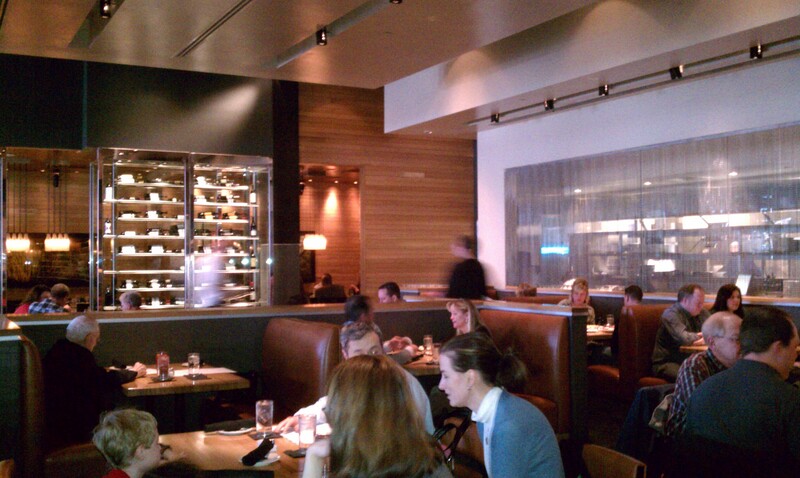 Surprisingly, they asked if wanted to sit down, and we walked into a relatively empty dining room. But in the next half hour it filled and stayed that way during our visit. I had read that the Tabard Inn kitchen makes its own doughnuts and that they could be order singly or by the half-dozen. Since the server had just set down a basket of homemade muffins and breads, we decided to just order one to split. Smart move. 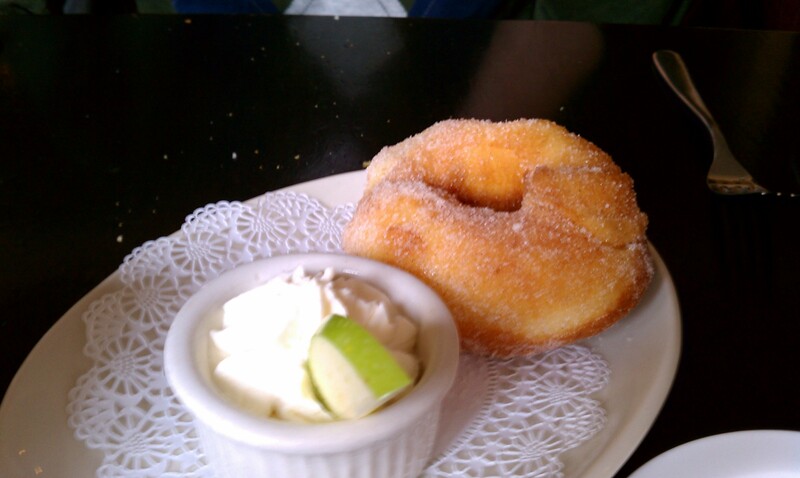 These were full-sized, not little donut holes; rolled in cinnamon sugar and served with vanilla whipped cream. I’m not generally a big doughnut fan, but these were light and served warm, what’s not to like? 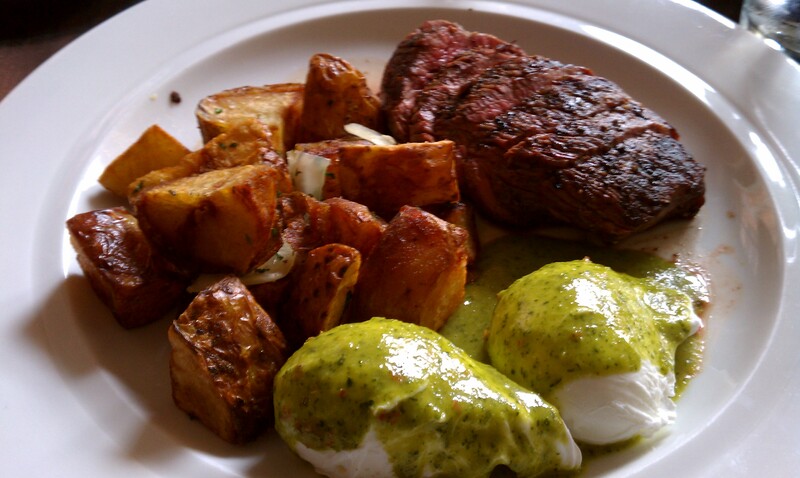 My son ordered steak and poached eggs with chimichurri sauce, and while I was tempted by the seafood gumbo, when the server told me its heft might require me to take a nap afterward, I opted for the huevos rancheros. 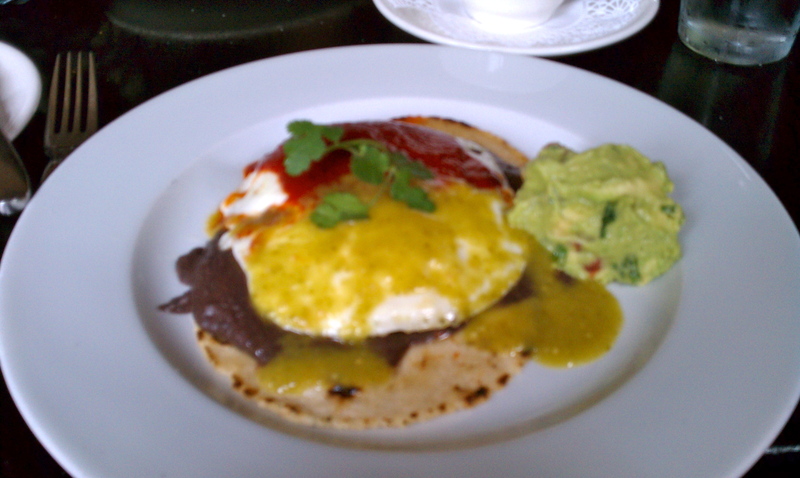 Though the green and red salsas lacked a kick, they nicely complemented the black bean puree, avocado and perfectly cooked fried eggs that smothered the tortillas. The menu features an large number of both breakfast and lunch items, and I would have been happy with any number of them. And the tavern-like ambiance is just as much of a draw. As we left, the living rooms were filled with people waiting, some chatting while sipping drinks, and others reading the newspaper to pass the time. I was tempted to assure them that it would be worth their while to stick around.